In order to find success for your business or project in today’s world, you have to be able to successfully leverage social media. However, social media is a crazy world that’s always changing. It can become almost a full-time job just learning and keeping up with the changes. But, you can’t be distracted by all of that… You need to be focused on doing what you do best! That’s where Rogue Creative Development comes in! Whether it’s making sandwiches or making helicopters, we want to let you focus on doing what you do great and let us take care of making you look awesome! And, since social media is a pretty universal need, we wanted to make it easier than ever to get quality social media strategy and management for you and your brand! 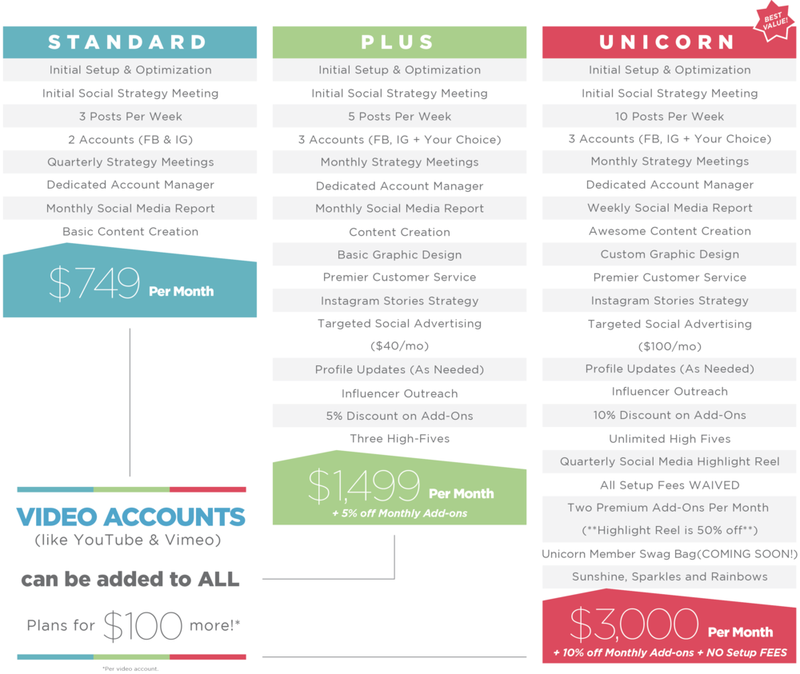 Introducing our NEW SOCIAL MEDIA MEMBERSHIP PLANS! We wanted to create an easy one-stop shop where you can find exactly what you’re looking for, at exactly the right price (AND at a discount!). Our Social Media Membership Plans are designed to give anyone, from the new, small business owner to the experienced industry veteran exactly what YOU need, when YOU need it. We’ve broken our offerings down to 3 membership plans; the Standard, the Plus and the amazing UNICORN plan! (That’s right, we brought an awesome mythical creature into the mix!) Choose whichever plan suits your business best, and simply use our Add-Ons or PREMIUM Add-Ons to get any extra projects you may need (such as a product photoshoot or highlight video of a recent event), as they come up! For more information including our add-ons and their rates, check out our new Social Media Marketing page! Newer PostRogue’s Half Year Roundup!